By no stretch of the imagination would a one for seven night shooting from the floor lead to a record setting triple-double for All-American guard Sabrina Ionescu but that is exactly what happened Sunday afternoon in Oregon’s 102-82 win over Buffalo at Matthew Knight Arena. 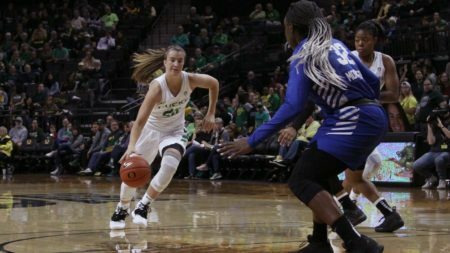 Not that the Ducks (4-0) were in need of her offensive firepower the way they were in last Saturday’s win over Syracuse when Ionescu drilled a pair of treys to erase a late six point deficit. Baskets weren’t an issue Sunday with all five starters recording double figures in scoring giving the Ducks the lead for all but 32 seconds of the game. Ionescu finished with 12 points, 10 assists and 10 rebounds, the last of which was secured with an offensive rebound with 1:22 left in the game. Oregon hit 54.9% from the floor going 28 of 51 and 12 of 24 from three. The Bulls (2-1), who are projected to win their conference and was a Sweet 16 team a year ago was led by Ciera Dillard’s 32 points. Courtney Wilkins added 19 and Keona Walters 16. As a team Buffalo made 28 of 67 attempts for 41.8%. Oregon out rebounded the Bulls 35-23 and feasted at the free throw line, sinking 34 of 38 attempts. The Ducks hit the road for a pair of games in the Saint Mary’s Invitational tournament, facing UC Riverside at noon on Friday to open, then squaring off against the host Gaels on Saturday at 2:00 pm. Oregon returns to Matthew Knight Arena to host Long Beach State on Sunday, December 2nd with the opening tip set for 2:00 pm.